Understory at The Spheres is a multi-functional exhibit and visitor center designed to tell the story of The Spheres, Amazon’s iconic and wholly unique insertion into the heart of Seattle. 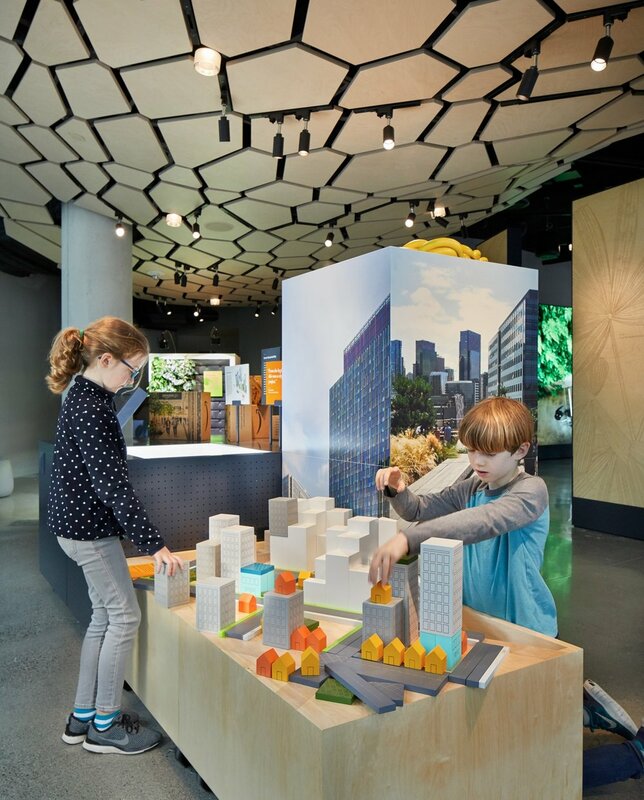 The exhibit unravels the complexity of the architecture and engineering and the very idea behind bringing people closer to nature on a daily basis in the heart of the city. The 3,883-square-foot exhibit is situated at the base of one of The Spheres, providing a fly-through of the orbicular buildings above and something the visitor won’t get in The Spheres themselves, extreme close-up and intimate footage of the plants in an interpretive and immersive experience. 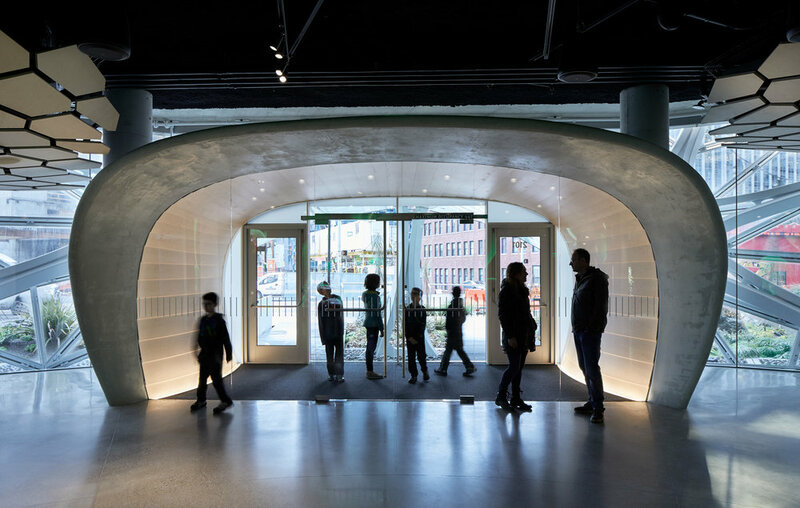 The experience begins at the entry, which features a curved, organically formed vestibule, crafted in venetian plaster. Entering the space itself, a series of tall, high-definition screens encircle you, providing a shifting video panorama of plants and trees, accompanied by a soundtrack that evokes sounds of nature. At distinct locations, visitors standing in front of the large video wall can hear stories about the plants in The Spheres that sound like whispers through the forest, which nobody else can hear. 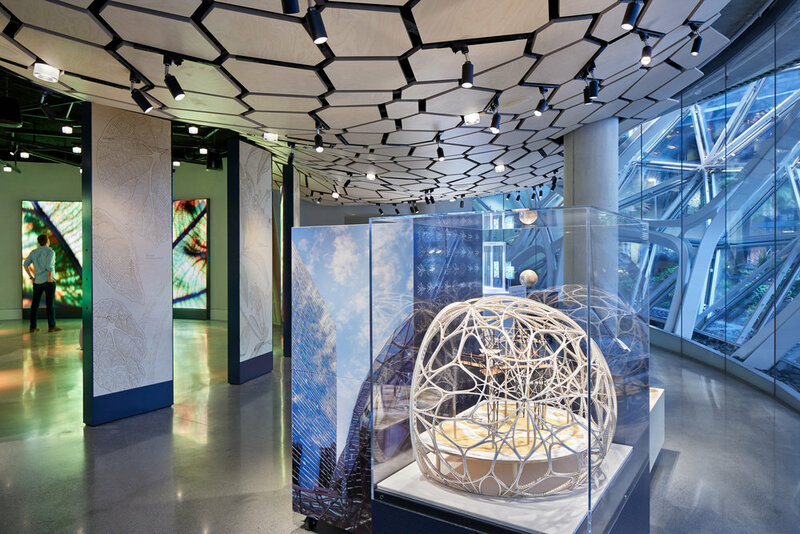 Arrayed around the perimeter of the space is a series of five displays, each providing a deep-dive into different aspects of The Spheres’ story, such as biophilia, the idea behind The Spheres, and the design and engineering of the buildings. Modular cubes are assembled into a variety of forms to display architectural models, three-dimensional interactives, and a changing array of small-scale plants. 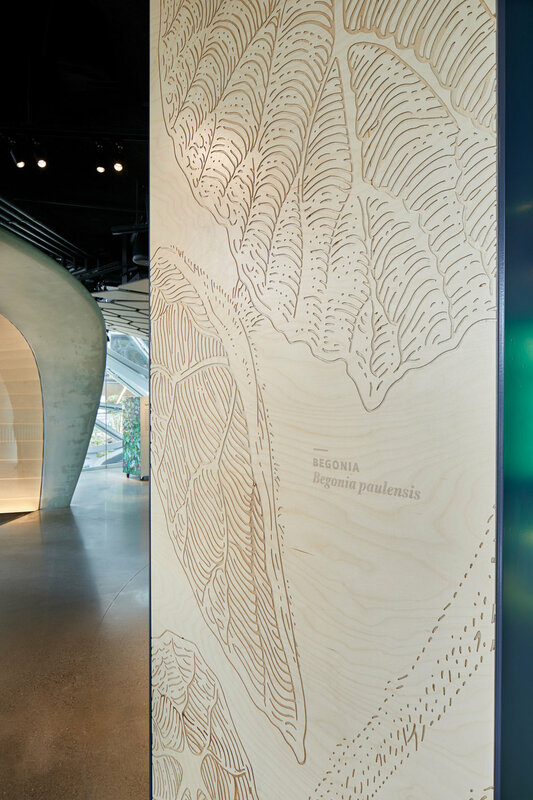 Touchscreen installations hold video content for visitors to immerse themselves into interviews and stories about the plant life and the architecture. The modular units dig deep into technical details. Over three miles of under-slab wiring was installed to support the multi-use space and exhibits. Restrooms are located behind the primary curved projection wall. To minimize the footprint, unisex toilet cabinets line one wall, while sinks line the other, relying upon a single circulation space. Among the design challenges was the need to evoke the drama and wonder of The Spheres in a location that feels nothing like the lofty spaces of The Spheres themselves. The physical space was formidable: an enormous duct occupies a huge part of the ceiling, which was already quite low; there is a column in the center of the space (it supports one of the largest trees above); and natural light is very limited. To conceal the ductwork and equipment—which would otherwise be an imposing presence overhead—an array of custom-designed hexagonal Baltic Birch plywood panels organically reshapes the ceiling. The venue also needed to be imminently flexible; the solution was to put virtually everything on wheels, making it possible to completely transform the space when needed for presentations or parties.